The most visually dramatic entry to Newcastle must be by railway from the south. Through a brick-lined cutting and under a succession of highway bridges the tracks curve to take the train on to the King Edward Vll Bridge. It carries the train 1,000 feet across and 110 feet above the River Tyne as one of seven such crossings within a mile. 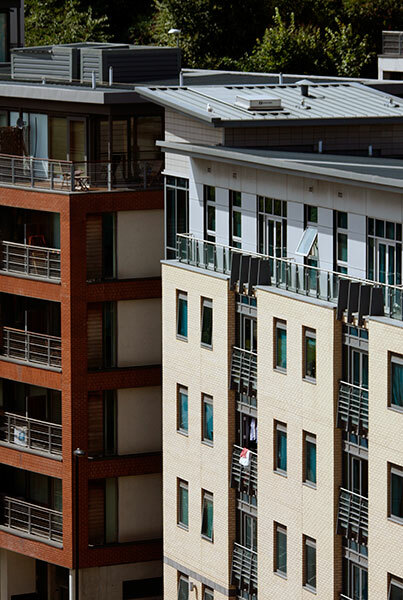 In this image, new apartments on the Close stand below the Central Square South building. 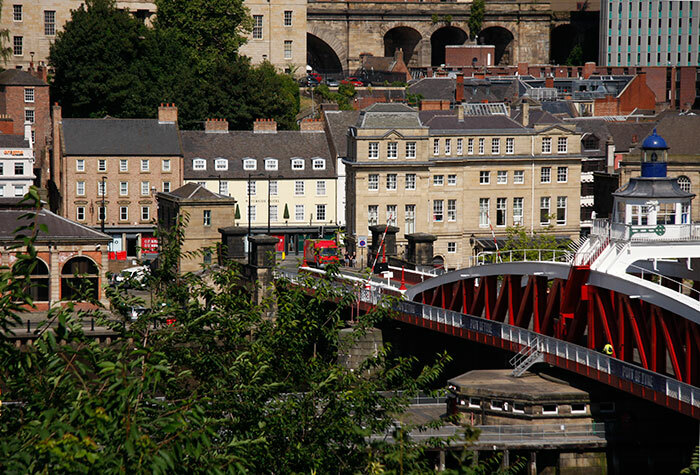 The High Level Bridge crosses the Close and Sandhill where some of the oldest City buildings are concentrated. These new high-rise apartment buildings seem to take design clues from earlier neighbours. 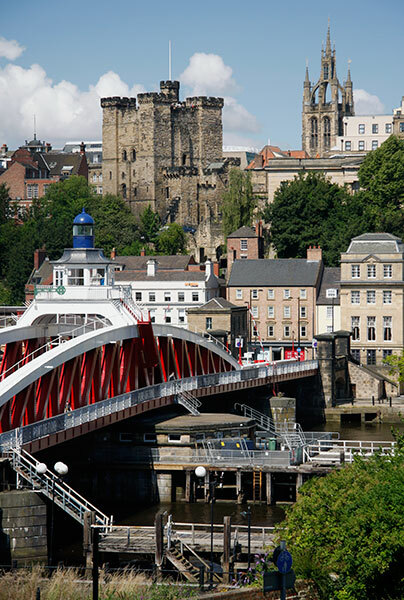 The High Level Bridge, the Castle Keep, the Tyne Bridge, the Sage Gateshead grounds and the Baltic Centre viewing deck all offer fine city centre panoramas. 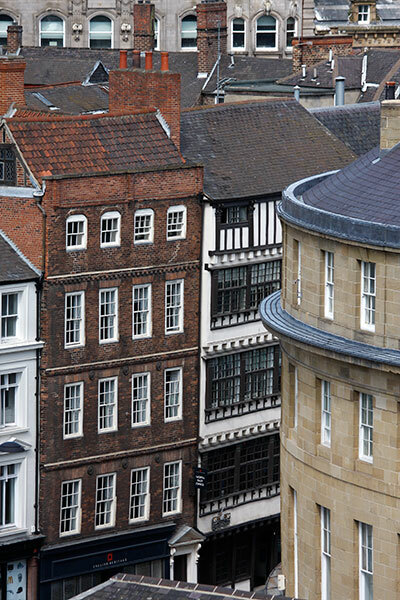 The half-timbered structure is the five-storey Bessie Surtees House incorporating two merchant’s houses, originally 41 and 44 Sandhill, with histories from the 15th century. The names Surtees House and Millbank House were given later. A plaque records the 1772 elopement of Bessie Surtees and John Scott who later became Lord Eldon and Lord Chancellor of England. Almost two thousand years ago the visiting Romans built Pons Aelius across the river at this point. It was followed by 13th and 18th Century structures. The Swing Bridge was completed in 1876 to the designs of William Armstrong, a pioneer in hydraulic power. Both the hydraulics and turning machinery housed in the central pier are original although electricity has superseded steam to power ancillary equipment. The stone viaduct at top right was built to carry the tracks of the 1839 Newcastle & North Shields Railway. 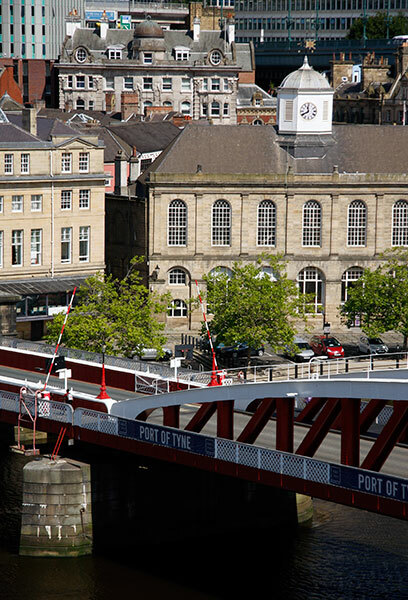 The northern section of the Swing Bridge fronts the Guildhall & Merchants’ Court building. On the site of an early 15th Century building the core of the present structure survives from Robert Trollope’s rebuild of 1655. The north and south facades were remodelled at the end of the 18th Century. John Dobson designed a semi-circular eastern extension in 1823. Crossing here at river level one can go west to see earlier buildings or east to walk past the younger facades illustrated in later images. 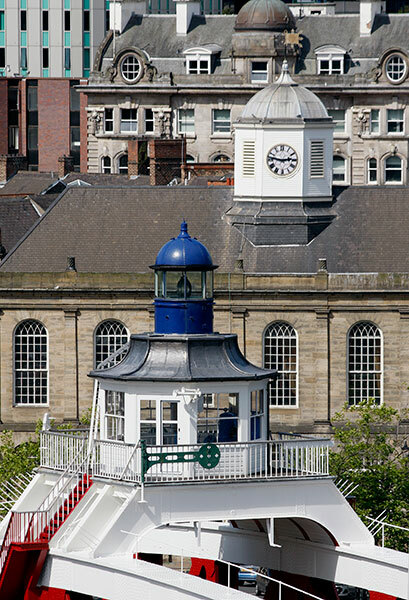 The forms of the control cupola and navigation light on the Swing Bridge echo those housing the clock on the Guildhall beyond. 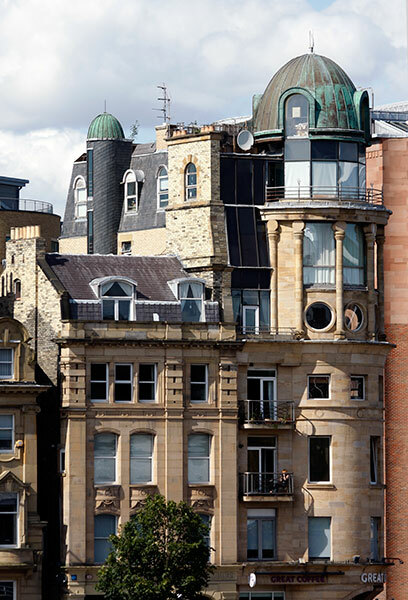 The more ornate grey stone Akenside House and its plain dome is on the Side, a street starting the long climb into the heart of the fine nineteenth century new town designed by John Dobson and other notable architects. Steep Dean Street becomes the long curve of elegant Grey Street, described by writer and architectural historian Nicolaus Pevsner as ‘one of the finest streets in England’. The Castle Keep and St Nicholas Cathedral dominate the sky line. The former was built between 1168 and 1178 during the reign of Henry II. Its mid-13th century Black Gate stands close by. Significant fragments of the medieval town wall survive in several city locations. The original church was built c1091. Much of the current building dates from the 14th century to which the tall lantern tower was added in the mid-fifteenth century. 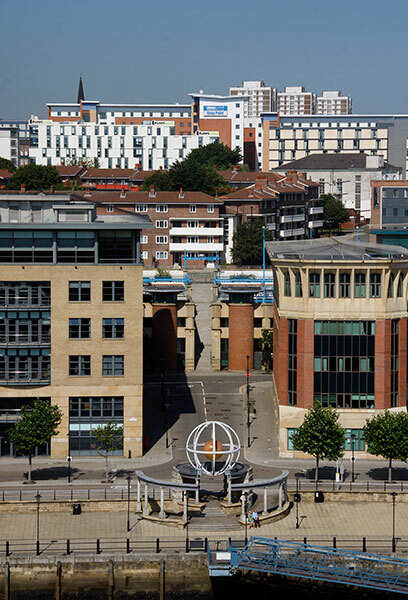 This view from the wooden jetty on the Gateshead bank shows the John Dobson extension to Guildhall and a glimpse of the buildings on Sandhill beyond. The Moot Hall and Castle Keep stand above. Ocean-going ships once moored as far upriver as this and beyond; their mooring bollards remain. Railway and crane track once ran the length of the quayside down to the Ouseburn. Ships passed up and down through the Swing Bridge to and from coal staiths, shipyards and industry in Elswick and Dunston. King Street joins the quayside to the steps leading up to All Saints Church. This replaced an early medieval building and was consecrated in 1789. Elliptical in plan, its tower with steeple is fronted by classical columns and pediment. Restored in the 1880s and deconsecrated in 1961 it seems little used. Fine examples of Victorian and earlier architecture contribute much to the townscape. Some late twentieth century buildings around it are not of the same quality. The building to the left is the Baltic Chambers dating from around 1900. Its idiosyncratic neighbour of 1991 was designed by Ryder Nicklin. Now Ryder Architecture, two of its more recent local commissions are the Newcastle Central Library and the interior transformation of the John Dobson portico at Newcastle Central Station. 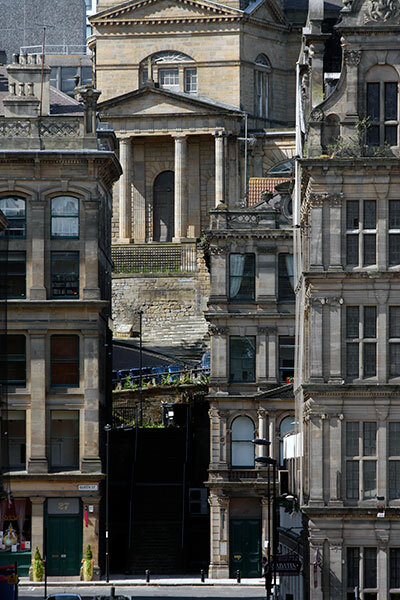 A sliver of red brick and sandstone from the Law Courts edges into the image. Formerly the Rank Flour Mill, the striking building housing the Baltic Centre presents changing exhibitions of international art. 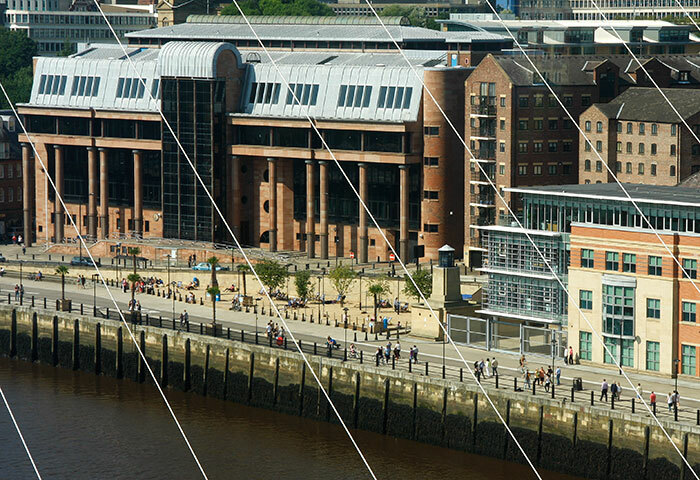 Views from its windows are enhanced by those from a viewing deck high above the river on the Gateshead shore. The large central building in this perspective is the Custom House of 1766, revamped by Sydney Smirke in1833. In May 2015 a new building is under construction in the adjacent break in the street frontage. Many of these fine quayside buildings once housed maritime businesses. 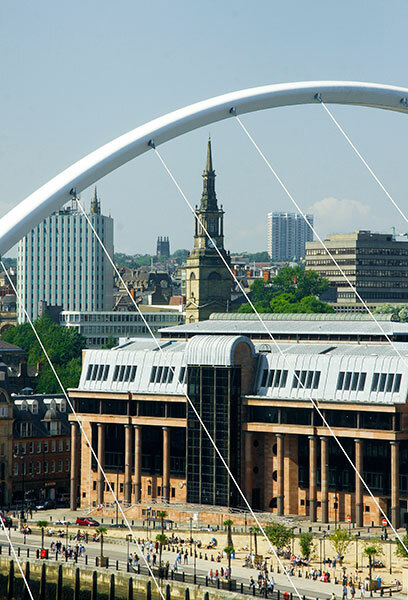 The upper arch span of the unique Gateshead Millennium Bridge encloses the Law Courts building built to the 1990 designs of Napper Collerton. The spire of All Saints Church stands beyond. The bridge was designed by Wilkinson Eyre Architects and civil engineers Gifford & Partners. Cables from the upper arch support a similarly curved deck carrying a footpath and cycle way. Pivots enable hydraulic power to rotate the bridge to open it for river traffic. 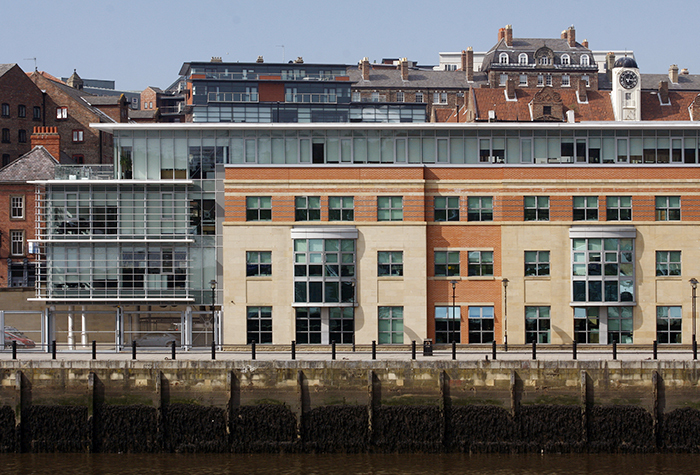 The use and appearance of the quayside has changed radically over the past forty years. Ships once moored from the Swing Bridge to beyond the Ouseburn, serviced by tall travelling cranes. Its wider eastern end towards the Malmo Wharf and the Ouseburn carried long storage sheds. A branch line from Heaton on the Newcastle-Edinburgh railway curved sharply down to the river through two tunnels bracketing the Lime Street cutting. One of its electric locomotives is in the National Railway Museum collection at Shildon. 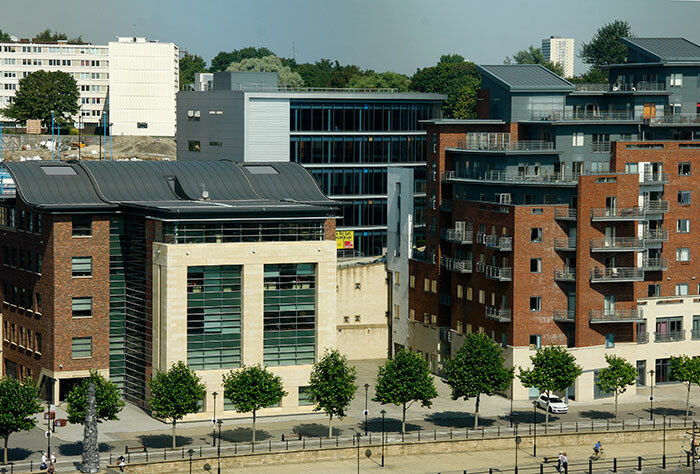 NEPIA House dates from the 1990s as one of the early buildings in the quayside redevelopment plan. The original brick and stone design was reworked from 2011 to include this steel and glass extension and full-length clerestory floor designed by Ryder Architects. 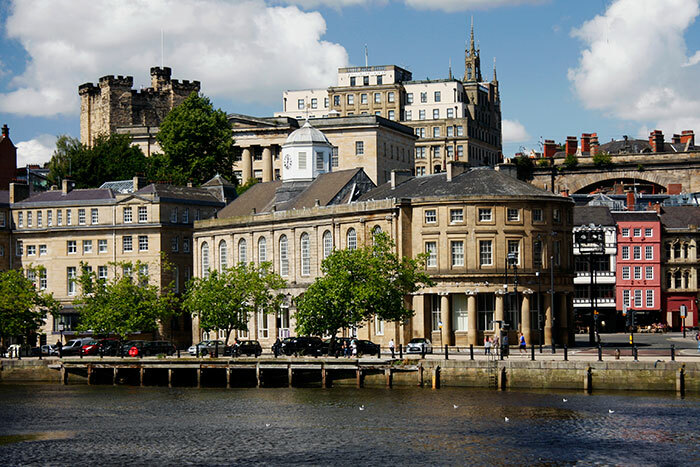 The Tyne, a nineteenth century public house, and two tall brick warehouses converted into apartments, edge inside the left frame. Low tide exposed the darkened underwater masonry and its brown seaweed covering. The clock tower of the 1701 Keelmen’s Hospital stands beyond. Originally flat roofed, the Co-operative Society warehouse building was completed in 1900 to designs by Louis Mouchel. The top floor and vaulted arch roof were added in 1908-09. It’s constructed in concrete reinforced with mild steel bars, a method developed in France by Francois Hennebique to reduce fire risks. 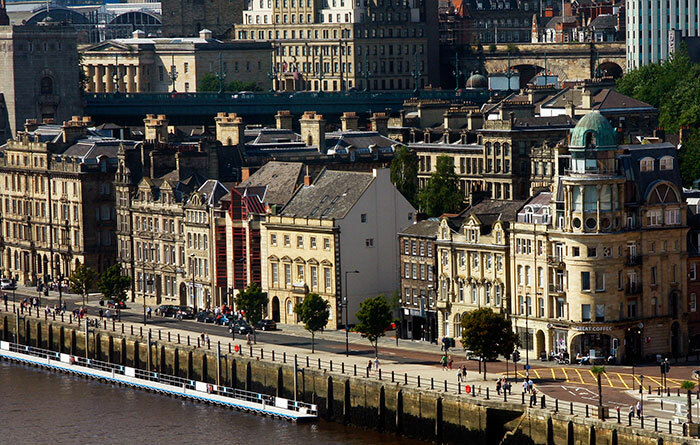 The extensive warehouse fires in Gateshead and Newcastle in 1854 and the 1866 destruction of flour mill and granary buildings below the High Level Bridge are local examples. 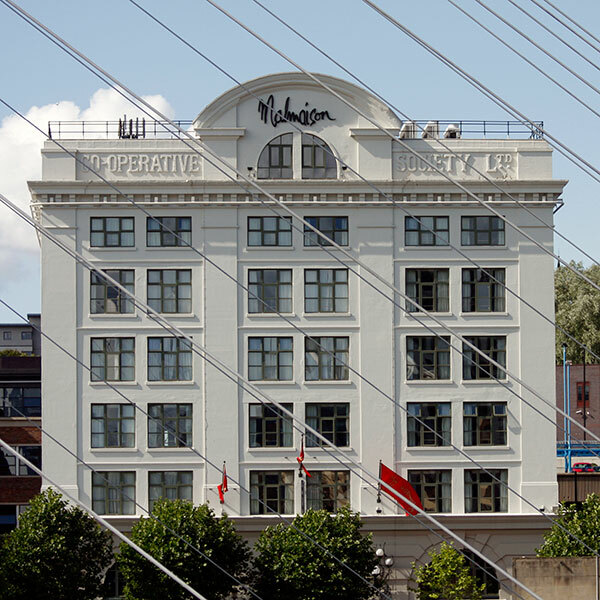 Converted and restored in 1994 it now houses the Malmaison Hotel behind an unaltered exterior. 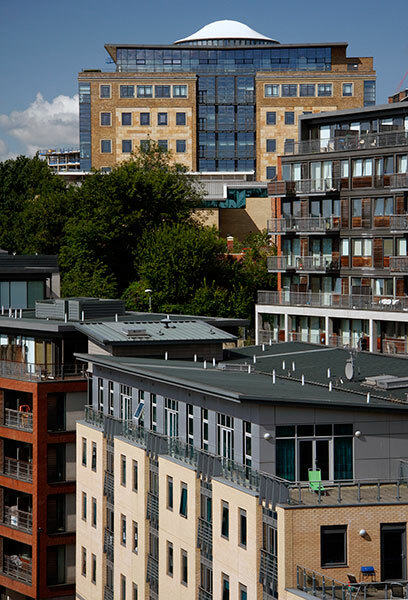 Apartment buildings across a range of periods and styles form the backdrop to two late 20th Century office developments. Quayside House by architects Hadfield, Cawkwell Davidson and the St Ann’s Wharf building frame stairs rising through a multi-storey car park to the streets beyond. 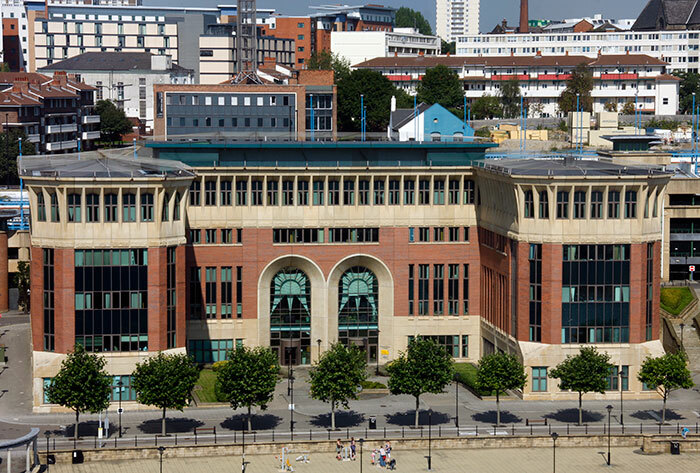 The 1998 Swirle Pavilion by Raf Fulcher is set into the foreground, one of several commissioned sculptures placed along the quayside. A stream of the same name once flowed here; a short street carried the name forward to the new street grid. The large St Ann’s Wharf building of 1997 was designed by architects CZWG. It was in this area that the railway tunnel noted in Image 13 opened on to the waterfront. East of the Law Courts and The Tyne pub, all the industrial buildings and rail yard infrastructure have gone without trace. Twentieth century housing and commercial buildings form the backdrop. Rotterdam House offices and the St Ann’s Quay apartment building are currently the last of the quayside redevelopments begun at the Law Courts. The blue glass of the half-oval form of East Quay 5 stands beyond. To the right there is an open space awaiting development and beyond are three low rise apartment buildings on the former Malmo Wharf and the confluence of the Ouseburn and the River Tyne. The OUSEBURN IMAGES gallery illustrates buildings from the valley’s industrial past undergoing restoration, clearance and replacement in 2007.